Feature and Follow is a weekly meme hosted by Alison Can Read and Parajunkee! If you could follow me on Facebook or Twitter, I would be happy to return the favor. - and how did you react? 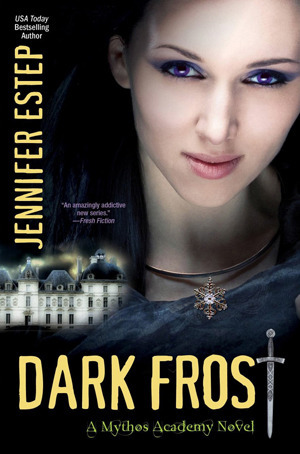 The most emotional scene I've ever read was in one of the books in the Mythos Academy series by Jennifer Estep. Dark Frost I think it was? If you haven't read the series yet, then I wouldn't read anymore of my answer, because it'll contain spoilers. When Nott sacrificed herself for Gwen.....my heart literally stopped. You see, I have a soft spot for animal companions, and to be honest, I cry more for them when they die, rather than the human response to cry for a dying main character. Sad, I know, but it's just the way I am! Don't judge me! I was crying hysterically, and every time I thought I had myself in check, I would start bawling all over again. Of course part of the reason could probably be because I was PMSing and my emotions were all out of whack. xD Ladies, you know what I'm talking about. And if there are any guys reading this at the moment.......awkward. How about you? What was the most emotional scene you've ever read? I wasn't able to get into the Mythos Academy series, but I've only read the first book. I'm going to try and read the others and see if I like them. And I feel the same way. I get very upset over animal companions dying! Yeah I didn't like the first book either, but it definitely gets better through the series! Oh, no. Animals are so innocent, I cry when something happens to them too (except spiders). Saw the cover and decided to skip the reasoning for spoiler purposes! I still have to start this series! Daphne, I'm really looking forward to checking this book out. IT WAS SO SAD!!!! I was crying too, not breakdown cry like you, but I did shed a tear or two. I tend to feel that way about animals also. Thanks for visiting my FF. New follower. I didn't read the spoilers, but I have the series on my TBR list. Knowing it comes with big emotional investments is actually making me want to read it even more! Hopping through. I keep meaning to read any of Estep's books, adult or YA. I have not read the book yet but I plan to. I want to catch up on her Assassin books first. I haven't read this book, but I've really been wanting to read this series! Oh I really want to start this series! Thanks for sharing! I love hearing from you guys and read every single comment posted! :D If you follow me or post a comment on my blog, I always try my best to return the favor. :) This is now an award free blog. I'm truly honored that you thought of me, but unfortunately I don't have enough time to nominate others. Happy reading, and I hope you enjoy my blog! Daphne has read 1 book toward her goal of 100 books. Daphne has read 2 books toward her goal of 120 books. Daphne has read 1 book toward her goal of 200 books. 2/5 Wasn't my cup of tea, but it didn't have me banging my head against a wall. 3/5 Ehhhh Not bad, but I won't be rereading it. 4/5 I enjoyed it and might even read it again! 6/5 It surpasses perfect! If I was run over by a bus at this moment, I'd die happy. Reviews are not to be copied without full rights to Reading Until Dawn. Publishers and Authors are free to use quotes or full reviews for promotional purposes. 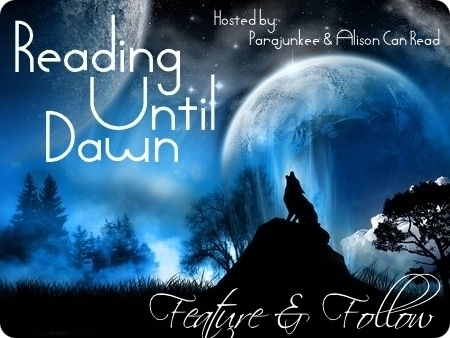 Header Design by Daphne @ Reading Until Dawn. Picture Window theme. Powered by Blogger.